きんぴらごぼう Kinpira Gobo is yet another classic dish in traditional Japanese home-styled cooking. But unlike Daikon no Soboroni, many of us have actually eaten Kinpira Gobo before without realising it. It is often used as a side-dish filler in takeaway bentos from Japanese delis and depachikas, most notable for the crunch from the root vegetables used. 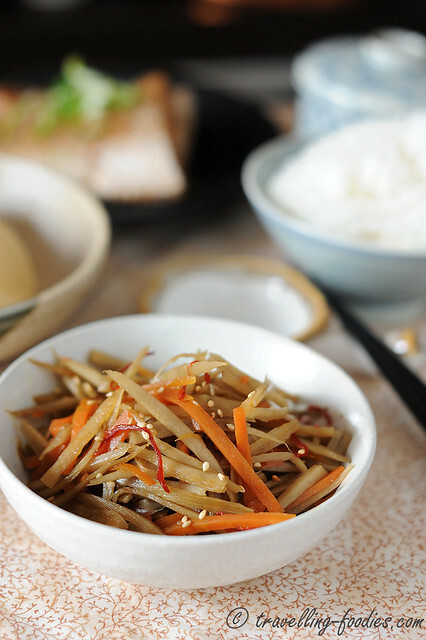 Sometimes written in Kanji as “金平牛蒡” Kinpira Gobo is a very versatile dish which can be improvised for other root vegetables like 蓮根 renkon (lotus root), 大根 daikon (white radish) or just 人参 ninjin (carrots) on their own. And yes! the Japanese name for carrots is the same as the korean and chinese name for ginseng!